The game reserve has Water Buffalo in very plentiful numbers. This is Australia’s premier big game animal and deserves the highest level of respect when hunting. These animals are extremely tough and difficult to put down and are every bit as tough as the African Cape buffalo, if not more! Buffalo charges can and do, occur! On average, I deal with at least 1 serious charge each year at Carmor Plains. Minimum recommended calibre is 338 Win Mag. We hunt Buffalo with the help of a 4wd or ATV either by finding fresh tracks that cross the road or spotting lone bulls out on the plains. Then we follow up on foot and get closer to the animal for a better look! Shooting ranges can vary from 20 metres in the thick rainforests and up to 100 metres on the open plains. 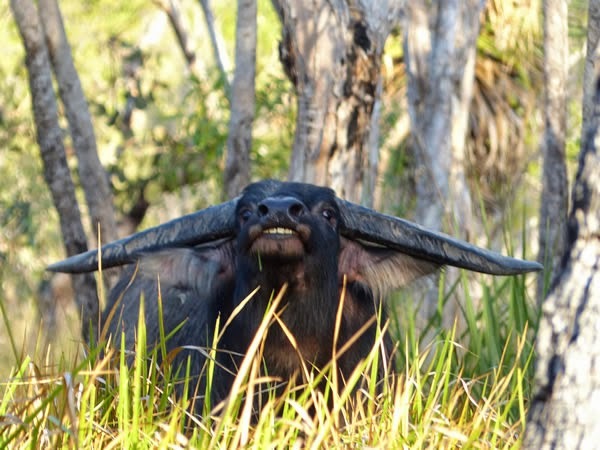 The horns of a mature Buffalo bull measure from tip to tip, 9 – 150cm (38″ – 60″) wide! With a length of 68cm – 90cm (27″ – 36″) for each horn. The diameter at the base varies from 40 – 48cm (16″ – 19″). A Water Buffalo bull weighs on average between 700 and 800kg, but in exceptional cases they can weigh up to 1,000kg (2,400lbs)!